In two sessions, the S&P 500 rallied 5%, almost 100 handles from the Friday low. The ex-post “cause” of the rally seems to be the punk September Employment Report, which boxes the Fed into a corner. Yellen’s inertia, and dovishness, during the September press conference, coupled with the subsequent soft employment data, led to an immediate feeling of: “oh my, now they can’t hike“. The surprisingly low payroll data initially got sold, but upon further reflection, the soft report created certainty, that the Fed is out of the equation, and zero interest rates will remain in place for as far as the eye can see. Markets prefer certainty, and thus the 5% explosion higher. It’s really that simple a 5% move. Using 2016 earnings estimates of $125, the market multiple moved from about 15x to about 16x. CJF expects the market to remain in a multiple band of 14x-17x, with some bias towards the lower half of this range. 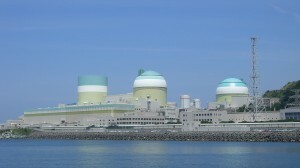 A sound way to participate in the market is to own the defensive utility sector. Utilities are down 5.3% in 2015 relative to the S&P’s 3.5% decline. For a slow growth world, with low rates, a juicy, and growing, dividend, sure makes a lot of sense. CJF believes the utilities are being shunned by investors with an old-school playbook of avoiding the space ahead of a rate hike cycle. CJF’s counter argument: it is abundantly clear that the next Fed rate-hike cycle (if we actually get one) will be the most tepid and cautious in the history of Fed rate hike cycles. One rate hike from 0% to 0.25% does not mean there will be 10 hikes up to 2.5%. While the Fed bubble plots maintain an overly ambitious forecast of a series of rate hikes, inaction, thus far, during a period of 5.1% unemployment, screams how different this cycle will be. The utilities are also under pressure because of exposure to energy prices and natural gas. Utility pricing is considerably more sticky than the underlying commodities, and moreover, energy prices stopped going down during the market’s recent bounce. The utilities already reflect low commodity prices and fears of several rate hikes. The impact of distant potential inflation. If a utility, in the extreme, is considered a perpetuity, the duration (~30) is more than 3x higher than the duration of a 10 year UST (~9). (pushes XLU yield > UST if you expect distant inflation). Different dividend tax rates: current income rate for UST vs. ordinary income rate for utility dividends (pushes XLU yield < UST). If the initial utility position remains unchanged over 10-years, the value of the dividend stream alone is worth 18.2% more with the utility, purely due to the growth rate of the dividend. In this example, the price of the security (XLU) would remain constant and the dividend yield swell to 4.76%. If over 10-years, the XLU appreciated, in-line with dividend growth of 3%, the utility position swells to 43.6% larger than the UST. 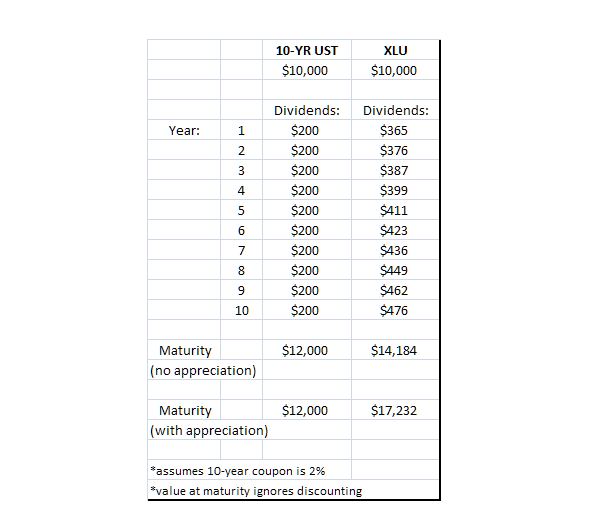 Attached is a chart of the XLU dividend yield relative to 10-year. Data go back to 2002. The red section represents periods where utility dividend yields fell below the 10-year. The green section is the other way around. The spread peaked at 3.46% during the financial crisis, and briefly revisited 3% during the height of taper tantrum (fears of stimulus ending). At present, the spread is 1.57%. Given the extent of Fed inaction, and how muted the upcoming rate hike cycle will be, it is likely that the XLU spread to treasuries narrow, perhaps approaching parity over the next 1-2 years. This would make the utilities a home run of an investment from current levels. CJF, great data-driven post. However, it seems to me to lack an assessment of the current fundamentals of buying utilities. BTW, I would think that the decline in commodity prices would be great for utilities — you imply that it was a negative already accounted for. 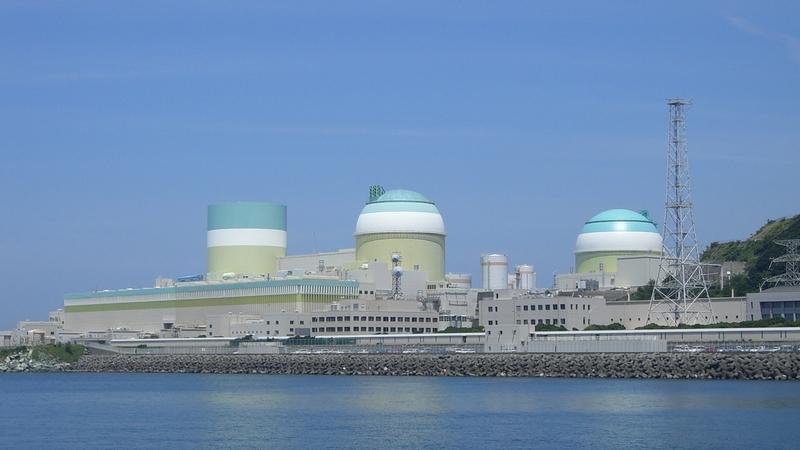 Anyone investing in utilities should consider: aging plants (especially nuclear), the financing needed for improvements and or new plants, home-based solar, regulation of coal and other green-house emissions reductions, possible increased rate regulation, better conservation, etc. Seems to me that there are a number of factors that could make utilities risky and perhaps explain why they have been trailing the DOW. Firstly, there are no stocks, or investments for that matter, that are truly riskless. I compared utilities vs. US Treasuries. Both investments provide stable dividend income, yielding 2-3%. Treasury coupons are fixed. Utility dividends are paid at a higher rate than treasury coupons (now) and generally grow (but not always). The issues you mention are true. But utilities always face issues, mainly from a regulatory and technology standpoint. ConEdison (provides electricity to NY metro) would potentially be obsolete if a solar company invented a way to create enough electricity to power your home, in a dramatically more cost effective manner. Though all new technology, related to electricity, water, gas, etc have issues from several standpoints. Con Edison (ED) (a stock in the CJF portfolio for many years) increased its dividend every year since it was a public company in 1977. Perhaps there is risk that the economics of Con Edison won’t allow a dividend increase in 2016 (or the near future), but providing electricity to the masses contains tremendous regulatory hurdles, with massive capital investment needed. For an electricity provider to usurp Con Edison tremendous technology and regulatory barriers must be passed. All of this is possible, but likely not the reason many utilities modestly underperformed in 2015. It’s because of energy prices coming down, and fears of interest rates moving dramatically higher. The second issue is off the table, the first issue is at least stable, for now. Good explanation, thanks. Overall, it sounds like utilities make sense as part of a balanced portfolio but I would be leery of devoting a significant portion of my investment account there.